Raaga.com: Alok Nath - ‘Sanskari Babuji’ displays his true colors! 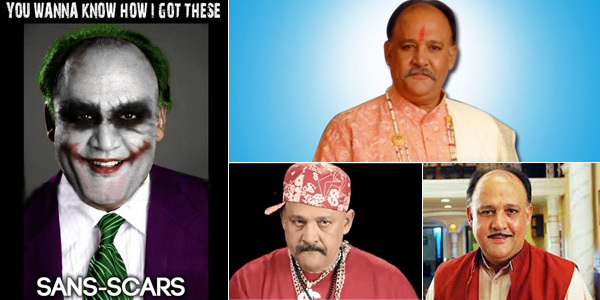 Alok Nath - ‘Sanskari Babuji’ displays his true colors! After the exit of famous character actors like Om Prakash and Ashok Kumar, TV actor Alok Nath took over their role of righteous father in Bollywood with the success of Salman Khan starrer MAINE PYAR KIYA. It may be noted dear Babuji (Alok Nath) lost his temper because a Marxist feminist and the secretary of the All India Progressive Women's Association, Kavita Krishnan, instead of supporting the Prime Minister Narendra Modi’s latest drive ‘Selfie With Daughter’ that called all Indians fathers to share their photos with their daughters, she criticized Modi for maintaining his silence on grave corruption charges against two leading women ministers in BJP, Sushma Swaraj and Vasundhara Raje. Alok Nath, a staunch Modi supporter could not digest the dig and the evil devil inside him came out with a vengeance, caring a damn for disgracing ladies. It may be noted Alok Nath may be playing the so-called ‘goody- goody’ sanskari Babuji’ on screen but off screen he is known to be violent and abusive. A picture of his negative side was exposed in 2007, when Alok Nath made headlines after he was caught drunk and hurling abuses at young TV actor Shiraz Khan in Mumbai’s posh resultant at 1 a.m in the night. Eyewitnesses reported that the Alok Nath was accompanied by his wife, yet he hurled cuss words at Shiraz and indulged in shameful brawl! So the devil in him bouncing back is nothing surprising! !